In tribute to the legendary explorer Christopher Columbus, Manufacture Zenith presents one of its most fascinating watch creations, clothed in a truly stunning attire. The unique nature of the complex mechanism is matched by an exceptional exterior and decoration. 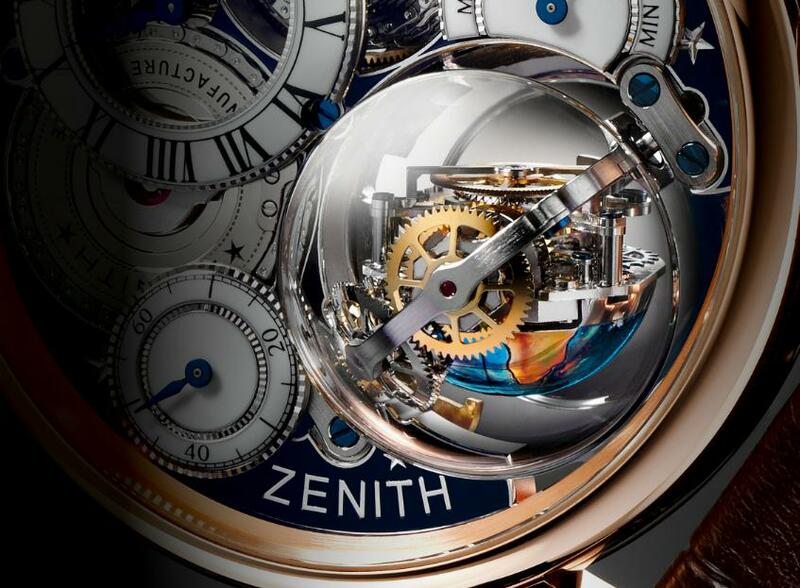 Delicate expressions of top-flight craftsmanship, engraving and micro-painting showcase the full measure of Zenith's virtuosity in creating horological works combining technical refinement with magnificent artistry. On the dial side, Zenith sets the stage for the horological feats gracing the movement, by creating an open structure affording a chance to view three mechanisms in action: the barrel with fusée-chain transmission (between 10:30 and 1:30), the gyroscopic Gravity Control system, and the high-frequency regulating organ (at 6 o'clock). 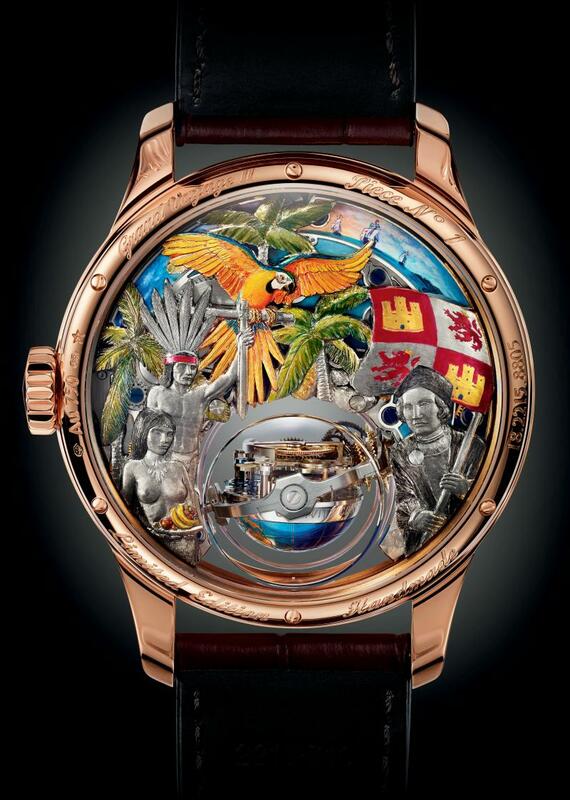 While the dial itself is the unmistakable signature of a work of excellence, the back of the Academy Christophe Colomb Hurricane Grand Voyage II harbours its own sources of wonderment. Providing a vivid and subtly layered portrayal of the adventures of the famous Italian explorer, this superb miniature highlights the virtuosity of the most brilliant artisans. Secured to the movement by a sophisticated system of gold appliques, this painting brilliantly illustrates Christopher Columbus' discovery of America in 1492. Created around the mechanism reminiscent of the gimbal suspension system on marine chronometers, the foreground of this tiny work reveals the effigy of Christopher Columbus brandishing the flag of the Spanish monarchy, surrounded by palm trees, two natives offering him exotic fruit, as well as a parrot. These delicate applied figures are finely hand-engraved and then alternately patinated or adorned in dazzling colors. Behind them, sailing across a deep blue ocean, the three famous Niña, Pinta and Santa Maria ships stand out against the backdrop of a luminous sky. The entire scene is micro-painted by hand. The hand-engraved décor portrays the "discovery of the Indies" with an infinite wealth of details, notably in terms of the clothing of the natives, the feathers of the flamboyant parrot, and the crests on the Spanish flag. Integrating this masterfully executed scene required considerable ingenuity and notably included finding points to which the applied elements could be fixed, while reducing the movement thickness and the spaces between the calibre and the adornments to an absolute minimum (less than a tenth of a millimetre beneath the figurines). Entirely hand-finished by artisans makes each timepiece a truly one-of-a-kind. As a mechanical watch gradually winds down, the movement loses amplitude (corresponding to the balance-wheel's angle of oscillation) and thus becomes less accurate. The fusée-chain transmission system serves on the contrary to keep the driving force perfectly stable throughout the full power reserve with the iso-torque shape of the fusée compensating for the progressive reduction in the force of the barrel. Transmission between the barrel and fusée is handled by an 18 cm-long chain comprising 585 parts. This highly complex construction features alternating double and intermediate links. Once assembled, it is capable of withstanding a traction force of more than 3 kilos. Throughout the power reserve, the mainspring transmits its energy to the fusée via a chain that wraps itself around the barrel. By adjusting the variations in tension, the fusée regulates the force that is passed on to the going train and thence to the silicon escape-wheel fitted inside the gyroscopic carriage. While it takes more than 50 hours (the power-reserve duration) for the chain to wrap itself around the barrel, winding via the stem provides a fascinating sight. These few seconds enable the fusée and the barrel to turn in opposite directions so that the chain wraps itself back around the fusée. 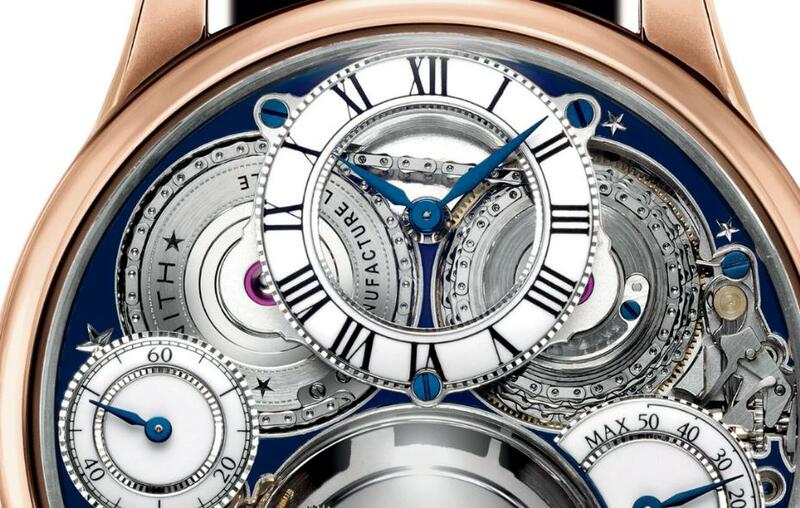 The shape of the fusée was dictated by the optimal force that the Zenith master-watchmakers wished to give the barrel. Its grooved contours as well as its dimensions are the result of lengthy and particularly complex complications performed for each of the seven construction stages. This fusée could doubtless never have been created without the full integration of all professions (notably including movement prototype making) cultivated in the Manufacture Zenith, nor without the use of sophisticated equipment. Such is indeed one of the core strengths of an integrated Manufacture. While fusée-chain transmission eliminates variations in isochronism (the equal duration of the oscillations), the Academy Christophe Colomb Hurricane Grand Voyage II also cancels out another effect that is detrimental to the rate of a mechanical watch: the influence of gravity. 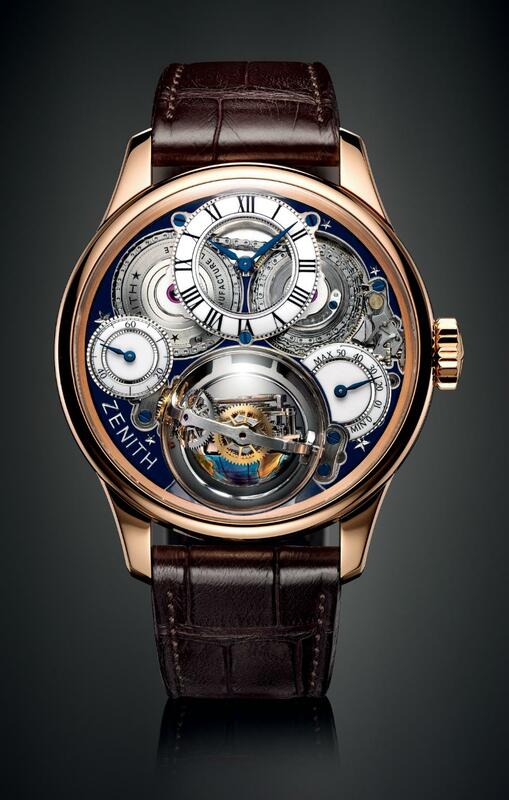 Working on the principle that keeping the regulating organ in a horizontal position engenders the best possible balance-wheel amplitude, that the rate is adjusted in only one direction and is not therefore the result of a compromise, and thus results in optimal timekeeping precision, Zenith devised and patented a revolutionary module enabling the "heart" of the movement and the escapement to remain constantly in this position. The case, in 18kt rose gold, measures 45mm x 14.8mm (21.8mm with domed sapphire crystal over the gyroscope). It has double AR-coated sapphire crystal and it is water resistant to 30 meters. Movement is the Swiss hand-wind Zenith in-house El Primero caliber 8805 with 53 jewels, 36,000 vph and a power reserve of 50 hours. 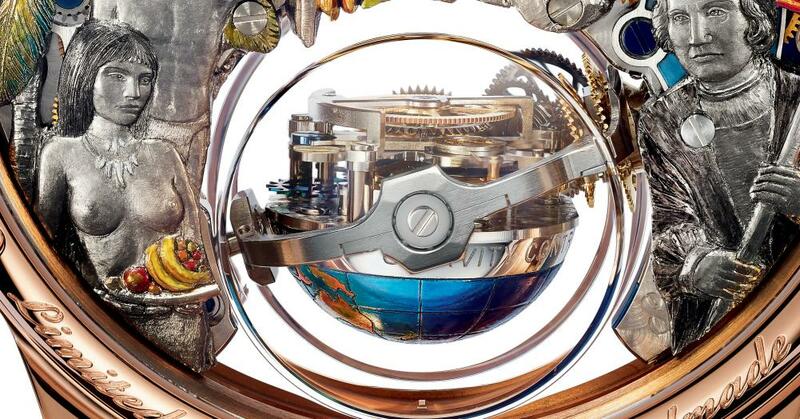 The movement consists of 939 parts, with the chain made of 585 parts and the gyroscopic carriage composed of 173 parts. 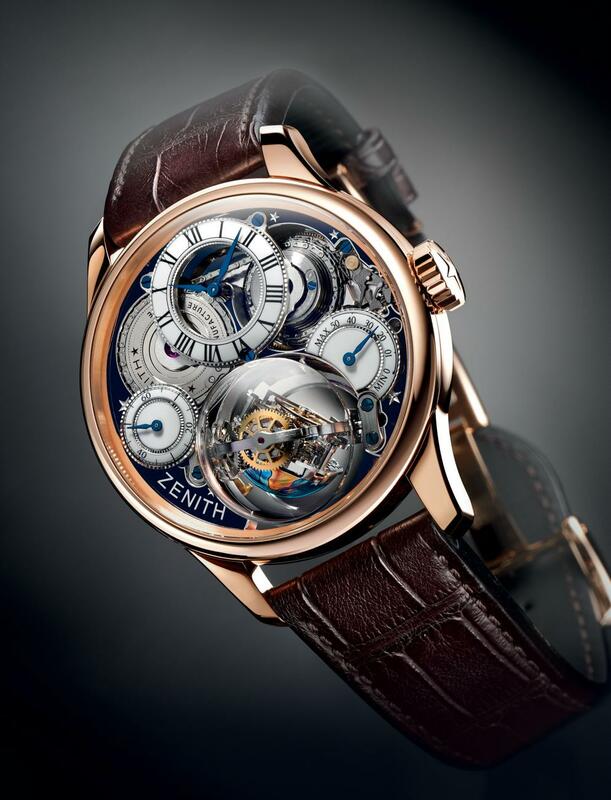 This unique gyroscopic mechanism maintains the regulating organ in a perfectly horizontal position, Zenith won the "Best Complicated Watch" category at the 2011 Grand Prix d'Horlogerie de Genève for this feat, that it invented after five years of intense development. Functions are: hours and minutes in an offset subdial at 12 o'clock, self-regulating Gravity Control module at 6 o'clock, small seconds at 9 o'clock, power-reserve indication at 3 o'clock and fusée-chain transmission beneath the hours/minutes dial. The mainplate has been entirely hollowed out by hand so as to reveal the Zenith logo in relief and a parade of stars; the hollowed parts have been filled with midnight blue lacquer. 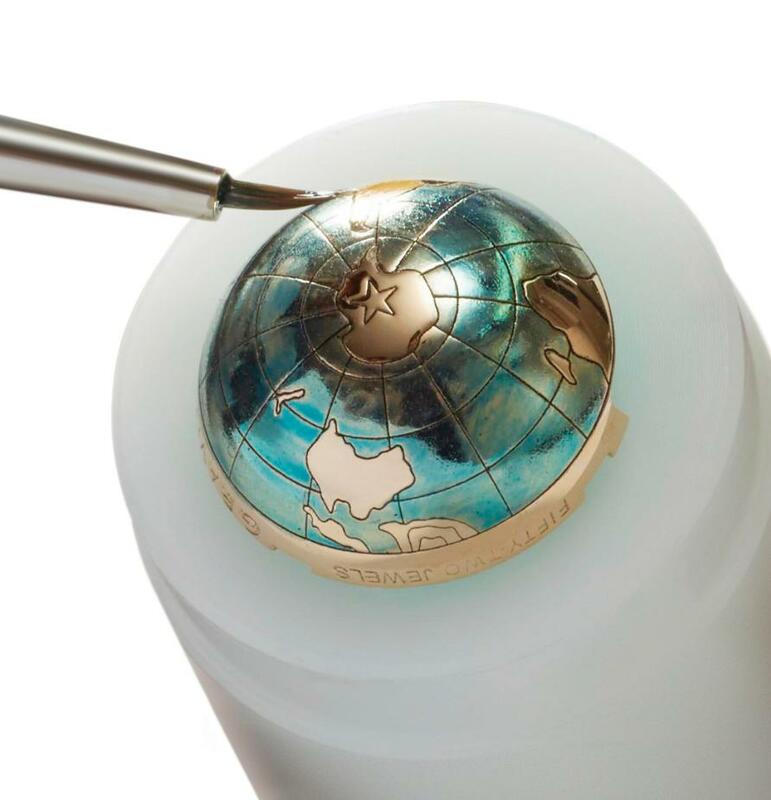 The counterweight of the Gravity Control system has also been adorned with a sophisticated and poetic decor featuring an entirely hand-crafted micro-painted depiction of the Southern hemisphere. It has three enamelled dials, with gold subdials and black lacquered hours markers with blued steel hands. It comes on a brown alligator leather strap with an 18kt rose gold triple folding clasp. It is delivered in a mahogany presentation box featuring ox bone inlays (which can also serve as a humidor with a capacity of 80 cigars). In tribute to Christopher Columbus, this box is adorned with a screen-printed motif on parchment-style papyrus reproducing Waldseemüller's planisphere (1507), the first world map to mention the name "America".